That would be a dumping zone. This is the first space as you walk down our basement steps, and because of that – everything just landed here. Well, most everything. It’s a big basement. :) Once this space was full, I would keep moving the piles around. A few weeks ago, when I started the massive decrapification of the basement (AGAIN), I made a few adjustments – I have learned the way I had things placed down here contributes to the crapifying of the space every year. The first change was to move a shelf that had most of my decor items from the back of the basement to this area – I found having in the back corner of the basement made it rare that I would actually walk back there and put the stuff away. So I moved it to this area. Then I realized how much decor STUFF I actually had, and ended up buying another new shelf to hold more. I did a lot of thinking about where I wanted everything else as well, and moved it all around to function better. Schnikeys. Ummm…this was better than the before before! WAY. Even though I had put the table and shelves in this area a couple years ago, it didn’t prevent it from becoming a dump zone. The table actually encouraged it really. Ack!! Isn’t it precious? Yes, I know, as precious as cement can get?! After I moved the shelves around, I thought hard about where I wanted to put everything on them. I realized a while back that the reason the table became such a pit was because the shelf with my tools was on the back wall – and that’s the one I use the most. Brilliant. It’s the simple things folks. Do you know how many cans of spray paint were usually thrown on the “craft” table? Because I didn’t walk the extra ten feet? I know, it’s only ten feet. But mentally, when you’re pooped -- it’s miles. The two shelves of extra decor are next. It will make such a difference having these so accessible! I used to trek around to a dark corner of the basement to put this stuff away, so it eventually, it just ended up in piles. I’m a piler, yes I am. I didn’t really need two sets of shelves, but I was determined to sort the decor stuff and make it easy to find everything. I purged and still have this much left! A lot of this used to be in bins – things like candles, frames, to-do projects. Having it all out in the open is SO much better! Wrapping paper drives me nutty – all the unraveling, rolling, bouncing around. Argh! This has worked awesome! I love that they are out of the way and still allow for items on the shelf. Once I felt like everything was in it’s place on the shelves, I moved on to the fun stuff. Whoohoo! I decided a long time ago this spot would be as girly as it wants to be. I’m the only one who uses it, and even though I’m not what you would call a typical girly girl, I really wanted a space to just have fun with! Fun colors, fun prints, fun textures. This was the perfect spot! One is a bin I keep gifts in, one is a tool box for extra crap junk stuff. Now I can craft, glue, cut, whatever, and not worry about the table. And it’s bright and happy! See the little green flower shaped thingy? It’s a silicon pot holder from Pier 1 – I got it for our kitchen, but realized today it would be the perfect little spot to rest my glue gun. I tried it and by golly, it works!! (Yep, I sure did just say “by golly.”) The hot glue literally wipes right off of it. How stinking cute is that? The little clips ($1) and pencils ($2) were from Michaels – the pencils MATCH. Dying!! Because my hubby often works down here during the summer (more on that spot later), we decided to add more outlets in the basement. Since the electrician was going to be here anyway, I asked him to add another light fixture in my craft area, and then a third light so I could swag a little fixture over the table. Let there be light!! It makes SUCH a difference to this area! It’s so bright and fun and now I can see what I’m doing when I work. Whoohoo! The $4 lamp shade was dressed up with a strip of extra fabric and some hot glue. Can I get a “CAAUUUUUTE? !” Say it with me Squeezies! This looks very cute! Being in red clay southeast Texas, I've never lived in a house with a basement, so all our extra storage goes in unfinished attic space, a backyard shed, or our garage. I have basement envy - serious! So great that you have a space for all your creative things! Doesn't matter that you have no drywall or floor. I'm sure you will turn into a fabulous space in the future. One thing that is really easy & practical for the walls in the basement. You can paint the walls with a waterproofing paint to 1. help with the humidity in the summer & 2. gives the walls a finished look. Congratulations on the decrapification of your basement! Oh my!! It's adorable! my basement is unfinished too, which makes it a magnet for crap dumping! You have inspired me to add some order and pretty down there! Love the fun color scheme, too! That looks great! I need to do something like this to my basement. What a great idea to keep your tools in the basement. Mine are in the garage--piled where I leave them after a project. Thaks for the inspiration. WOW.... I have been wanting to set up a craft area too. My office does not have space left for it unless I move some of the furniture pieces out onto the loft area. Your ideas are simple, cute and most of all inexpensive. Looks Great! LOVE it! I wish I had a basement to call my own, even a closet! LOL I have and use my huge laundry room as my crafty space,,, ! Your craft space looks great! I am such a freak about my house being cleaned and organized, but my craft room looks about 5 times worse than your before! I can't believe it has gotten so bad and have contemplated about posting it or not. Any how, thanks for the motivation to take mine on! It was my goal to have it done before last summer! Yep! Still haven't done it! I just shut the door! I am majorly jealous that you have a basement and don't have to go up in an attic all the time like I do. Major pain! Your area is just SOOOOO CUTE! I do have a craft table here right by my computer in my guest bedroom/office, but sure wish it was bigger. You did an awesome job! I have basement envy too! Your craft space looks great : ) I love how you hung the paper! What an awesome idea. Such a nice cheery workspace and plenty of room to work! Great job! Where did you get your wooden tray? I have been looking all around, but they are so exensive! VERY CUTE! Oh, how I miss my craft room. Sigh. totally jealous that you even have a basement in the first place... can't have those here! What an amazing transformation!!!! Thanks for sharing! Wow, what a huge difference! I love what you have done with the place. I bet that was a huge project but the after was 100% worth it! This is amazing change from your old place to a cleaner work area. Clever idea with the wrapping paper, now I wish I'd have more space to do my art and craft work. You are so lucky to have a dedicated space for crafting. You did a wonderful job updating it. LOVE this! And the idea with the wrapping paper is genius! What a great space. I just love your before and after pictures. It shows just what can be done. It is cute and ready for you to craft away to your hearts desire. Thanks for the inspiration. WOW! That looks amazing! I am sure you just LOVE it! Since I started reading home and craft blogs, I've been pleasantly surprised that others have some of the "issues" that I do: dumping, piling, not walking that last 10 (or 2)feet... Since we are living in our basement as we build "up", so our dumping ground is actually upstairs! My craft area is a small closet and corner of the diningtable. Your room is an inspiration to me! You have given me hope!!! About five years ago, I cleaned out our basement and began setting up my craft area...don't know what happened, but I didn't finish the process and now it's a pit again. Ah well...with spring, the dejunking and beautification will begin anew, thanks to your inspiration! I LOVE it! Great inspiration... half of my basement is the same way and your pics give me the nudge I need to get it organized and what better way to do it then make it a craft room! WOW!! All of my ribbons are closed up in photo boxes...i am now going to get the drill!! Thank you for the ideas!!! Such a gorgeous space! Now that would make me HAPPY to be creating there!!! Wow! It looks great! While I have claimed a small cart/counter in our garage for my projects, you've inspired me to at least unpile the piles in our little basement. It is just for storage, but I'm sure it would be easier to find holiday decorations and my extra home decor stuff if I organized it a little better. It looks fantastic! I can't wait to have my own area to craft! Looks great!!! I put all my extra decor on shelves in my basement too! GREAT job! Now it makes me feel so much better about my basement space. I love your husband's response...he's a keeper. I love it! Who needs four walls boxing you in? Looks great! I really like how you fixed the wrapping paper problem. I hate it when it starts unrolling! Your wrapping paper idea is genius - love it! You have given me motivation to get down in the basement and finish my reorganizing so I can have me craft area back. I too have cement walls and no drywall at the moment. I may eventually move it into the main basement area but for now it's in the utility room. I now believe that it can still be cute, so Thank You for that. Wow, that looks like a lot of work ! You're right, it is too stinkin cute, love it. Thanks for the before pictures! That is how my craft room looks right now! It is actually a bedroom so I just close the door, but it is not a fun place to walk by everyday! I think I need to get in there and WORK!! I love how you put those girly touches in there and made it a really FUN place to be!! Thanks for the inspiration!! Yay! Way to go! Do you just dance sown the stairs to go craft now?! I so wish I had a craft room! Heck, I'll take a craft closet! Love, love, love that fabric, the space looks great, enjoy! Oh what I would give for a basement! Or even a closet for all my fabrics and sewing "stuff"! At lesat my poor dining room table is good for something! :) Your "room" is so fun, I want one! I LOVE IT! I have a space in my basement too that needs some major work. You have inspired me to clean shop! You are just the most creative one with vision! Huge vision! I love your space and it's so big and caauuuute! I love it. That is adorable!! Very you. I love that you have a crafty cute girly polka dot space. You deserve it. I also love how often you use that hot glue gun... ;-) I've hot glued moulding to the walls before. For real. It worked! Are you kidding me? I would die for a space that big for my "craft room". Holy Cow! Love it! Can't wait to see what will come out of that room. Keeping a craftroom looking good and cute is a struggle I deal with. I have WAY to much stuff and little room....I have a combo craft/painting/office room. You did a good job making it look nice. ooh, my basement is now officially green with envy. i think i can fix that. nice job! To quote Rachel Zoe, "I die!!!!" Thanks for all of the great ideas! A couple of my favorites--painting the brass parts inside the clear lamp a fun green color. Hot gluing a skirt onto a folding table--genius! Hanging the wrapping paper--love it! Love it! Nice job (as always)! I have a similar fabric-covered table, and on top of it I've added that clear table cloth-type stuff (found on a roll in the fabric dept. of Wal-Mart or Hob Lob). Super cheap, completely transparent to see your cute fabric, and EVERYTHING wipes clean. Just a thought! I am really impressed! Can you come help me with my basement?!?!?!?! Ahhhh. such a pretty and organized space. I really liked how you organized your gift wrap. I hope to do a gift wrap post soon so I copied your image and link and hope to use them in a future post if that is okay? Looks adorable! I'm sure you don't want to move everything out now, but I would not be afraid to paint the concrete walls and floors! It would help to make the space even brighter and more fun for you to be in. They make epoxy paints? (the ones with the little dots they use on garage floors) in all kinds of cute colors. I think they can even add color to the waterproofing paint for the walls. I painted our basement with a city scene for the kids to ride their bikes in during the snowy winters and rainy springs here in Iowa. They loved it and it held up nicely. What a great place to sneak away to and get your creativity on! I love all the girly accents. And I especially love that you glue dthe fabric onto the table. Sometimes I get so hun gup on HOW to do something (like sew a table covering) that I never get around to it. I love that you just glued it on! Inspirational! wowza! Amazing transformation. Love it! Well, take a bow, my friend. What a darling space. . . so light and bright and FUNCTIONAL! I love the wrapping paper hung from twine--brilliant--and the adorable lampshade is absolutely wonderful. Way better than just plain old cute! You came, you saw, you conquered! Way to go!! I want a basement...really bad, I love this, I wonder what it feels like to have your "own" space? hmmm? Anyway great job! Looks great! I'm a piler as well, so I completely understand that messy basement concept. I love what you did to the room. Thanks for the inspiration. Wow...what a transformation! Your room looks fabulous! We are moving this weekend and I can't wait to start decorating the house and organizing it! Your blog has given me OODLES of inspiration. THANK YOU! I know I know, what a thought to have now that everything is in the right spot! I am feeling very, very inspired. I craft wherever I can, but my supplies in my garage look a lot like yours (before) and I am oh so guilty of not walking that 10 feet to put something away. Beautiful workroom! I love how you made it yours! Love the table top and the green hanging light fixture! Very cool! Heh. I love that there is a little sign that says "simply" on those lovely wooden beams in your before and after. Looks like you followed directions! It looks great! Hooray, I LOVE IT!!! Thanks for sharing all your over the top cuteness! Your timing on this post is perfect! I am closing on my first house this weekend, and there are 2 unfinished basement rooms that I get to take over...at least until there are more kids. But until then, I will be using this room for inspiration. The best part about my basement is the previous owners redid their kitchen and left all the old cabinets downstairs! I'm glad to see a before and after...it will keep me motivated. I just caught this and it is soooooo darling, chick, plus I'm in the throes of redoing my small little craft room (extra bedroom) and have had to make several runs with the truck to thrift stores so I could do something with it. It's not easy going from 5,000 s.f. to 1800 s.f. but I'm trying my best, sugar! This has inspired me to get rid of more junk! Oooooh, do I wish some of these bloggers lived closer to me so I could give them "stuff"! Very caaauuute, sweetpea. It looks fabulous and functional. Love the makeover. Looks great. My craft room needs some serious organization and de-uglifying. This looks so great! I have been working on combining three areas of craftiness into one room and it is killing me at the moment. It is looking a lot like your in between stage at the moment and I just can't seem to stay focused. It is so hard with a little baby to get things done! p.s. I love the green light! AMAZING! I can't think of anything else to say. I wish you could come help me with my house. You can't even tell it's a basement! I love it. That makes me happy, and it's not even my house. It must feel so wonderful to you! I love decluttered spaces! Adorable! How long did it take you to do all of that? I'm trying to decrapify our basement too and it is soooo depressing because I feel like I'm not making any progress. I also have a space down there that would make a good craft room- eventually. An idea: Have you thought of getting a clear plastic top cut to fit the top of your table? I love the fabric, but I'm the Queen of Spillage and I like things that clean up easily. I love this! I am jealous. I have a basement, but it's always soggy and musty smelling, so I'm not sure if I could do anything fabulous like this. But I will certainly be thinking about it, now! This came out adorable! I love it! My craft room is a definite work-in-progress! That has got to be one of the cutest crafting areas I've ever seen! I luuuuuurrrve it!!! Absolutely LOVE it!!! My craft closet that once was inspiring and cute is currently looking like a horrible before once again. I need to fall in love with it again! You did a great job with your space. It's soooo nice to have a little space of your own. I love your idea about hanging the wrapping paper! Most times thats unused space. Super job! And that is why you are the QUEEN. Nice! Another basement envier here. All my junk goes into our walk-in attic. CAAUUUUUTE! I am inspired to get my craft area organized, clean, working, and Caauuute too! That is so great!!! Makes me want one! I love the new look, but I think my favorite part is the great idea that you have for the wrapping paper. Seriously, those rolls drive me nuts and take up so much usable space in my craft room. Thanks for the solution! So awesome! LURVE (as you would say and I now say. Is it pathetic to admit you get lingo from other bloggers with whom you have never actually conversed??) IT! It looks like any crafty girls heaven! That looks so good! You've started me thinking about my craft/junk room and what I can do to make it cute and more useable. Plus I LOVE that idea about the silicon potholder. I might just be making a trip to Pier 1 soon! I have the same thing in my baasement except I hung curtains in front so I could close the shelves off when I don't want to see everything. One suggestion - paint the walls behind the selves! I am thrilled so far..
You did such a fantastic job! I can't wait to have a house of our own... or at least a craft area of my own! it's so very organized now. I need to get on track with some projects around here. Thanks for the inspiration! Wow! What a great job you did! I love the wrapping paper set up! The craft table is adorable and you must smile every time you walk down there! And, your husband's comment...NICE! Love it! Wish I had a big area like that just for crafting. I have an office but its not as big as what you have. I just put an office area together in my bedroom, and I am so much more productive and willing to do all the mundane tasks and energetic for creative endeavors when I have an organized space. I'm so excited for your new crafting space. ENJOY! Wow, your space is ah-mazing! ;) I am so jealous. I wish I had a space. Once again, you've done a great job! The thing I love most about it, is it's not all decked out and cost thousands of dollars like some craft rooms I've seen. Don't get me wrong I'd love to have one of those, but its totally unrealistic. I love that you did simple changes that I can afford too. Thanks for the inspiration. Oh...and the chandelier..adorable! What a great space! Love what you did with the lamp & the light fixture. Super cute! looks gaaaaaaaaaaareat! love it :-) Maybe a large rug remnant or one of those big rugs that bed bath and beyond has for dorm rooms to cozy up the floor and give the bub a place to sit and play while you work? I lurve it! I really need to spend more time using my basement craft area, but it's so danged cold down there right now. WTG! It looks so great! You are totally an inspiration to me! My husband really wants me to have my own space and I have tried and tried in the basement, but this gives me better ideas, it doesn't have to be expensive shelving and organizers. I like your simple ideas. Now to get the time and creativity to brainstorm and make it happen!!! I love hot gluing fabric for things, so easy!!! I love the light fixtures added to it as well! Sarah! I love it! Love, luv, L.O.V.E. I have to tell you, your last years basement cleaning post changed my life. I know that sounds funny. But it really did. We had a small storage room and it was so bad that I was having a hard time doing laundry. I went down stairs and cleaned it all up, with a few breaks. I had a baby at the time. I never had the desire before I saw your post. Now I want to be a little better and a litter cleaner. Thanks a bunch! I so look forward to each and every post you make, and I have absolutely no idea how you find the time or energy to do everything you do. You are awesome. Nice job on the craft room. As usual, you have gone waaayy beyond what I expected. Question: Evidently y'all made your shelving units in the basement, correct? How did you make them? They look awesome. I am in love with this post and this project. I am so impressed with how you transformed this space into something so functional and, yes, cute!! For me a craft room was in the 10-year plan, along with our finished basement. But, you just gave me hope that it could be sooner! What an improvement! Now I can't wait to see what you make up in there! What a great blog!!! My fiance and I have been contemplating redecorating, so it's great I found your blog. Before and after pictures are the best! You did an AWESOME job! Love your new CAAAAA-YUUUUUTTTTTEEE space! It's making me want to redo my work area stat! I am laughing here! I was Thinkin, CAAAAAUUUUTTTE while I was readin. Laughed out loud when I scrolled down to see yours!!! We are getting ready to move and I have a pottery studio and Craft crap corner that I have to organize into a smaller space! LURVE the wrapping paper solution! I WILL be using that one. Much better than those darn plastic boxes that take up too much space that you have to dig out of a closet and its just not worth it! Thanks for sharing your great space. I'm inspired! You have totally inspired me to move my craft table from its crowded little corner in my daughters play room to my basement where I can spread out and get organzied! I love the cover for the table, I'm going to Joanns today to find something similiar! What a great space you've made! I especially love the table and how you've covered it, looks so great now! - and using hot glue - I never thought of it- genius!! Now all you need to do is hang fabric covered batting strips down the concrete walls....it should warm it up a bit down there. Just staple the fabric/batting onto firring strips at the top & bottom of the walls. OH! You could do alternating stripes of the cute polka dots & a solid, or even a matching stripe! FUN! I SO wish we had a basement, but they are very hard to find in AZ. Love it!! Love the idea of the pot holder thing for the glue gun - totally stealing that! Thanks! I am drooling. First off, you have a basement, which I really miss being from KS. Now I live in Dallas, TX, which means NO basements. Second, you made a great space. Ooh the things I could create down there. Love it and love your blog. This is my first time to comment! I love your blog because of the way you journal. :) You make me smile b/c you call us Squeezies!! You were a guest speaker at our MTO last year and i am friends with Beckie, so I feel like I know you a little. :) Love your blog. Keep up the good work! It's sooo CAAUUUUUTE! Can you come to my house and fix up my basement?! I've been wanting to pain our cement walls and stain our cement floor but my husband is not cooperating. love the fabric on your tabletop! I'm diggin' the wrapping paper idea...keep up the good work, your blog is so fun! Thank you for this post. Your space is lovely and has made me appreciate my little basement space and has motivated me to spruce it up. So, thank you. Oh and I linked this post on my blog because I was truly moved by it. You did a great job cleaning up! WOW! You had a lot of stuff. It feels good to clean it up doesn't it? I forgot to invite you to my Treasures and Trinkets Thursday. :) Just linking up things we love!! woo hoo, I love so much!! Have a blessed week!! That wrapping paper idea is just about the most brilliant thing I have ever seen! I'm so jealous! A cute girly space for crafting? Lucky girl! Love it! Now I just need to make it happen over here! I absolutely am soooo jealous! I wish I had a space for my projects. Hubby does not take very good care of his work bench, maybe I'll take over that! Your basement,the shelves and everything else, fantastic. Simply put, I have hope now for my un-drywalled basement and clutter down there. Thank you! I love it! I *wish* my basement looked like this!!!! I *need* this! Great job! Love how it all turned out!! I love your craft room. I really wish we had a basement so I could have my craft room out of the way. Right now my craft room is the former dinning room in the middle of the house. I also wanted to add that I love the little bi plane on the top of your decor shelf. Thanks for all the inspiration. you are SO LUCKY to have a space. love the idea for the wrapping paper too. Please check out my blog, I would love your advice on what to do. This is exactly my same situation. I just need the fabric that I choose to fit the room decor... its still in the making. :) Any other tips on how to get the fabric to attach to the table would be great! Thanks! I was so expecting a perfectly decorated basement that was supposed to be passed off as a "work/craft room", but in reality, no one would ever want to use because it was, tooooooo perfect. I love this! I, too, have nice cement walls, some unfinished drywall and cement floors. This made me feel like making this area cute and inviting is actually possible. WITHOUT spending thousands finishing the basement. What a nice work space. You have motivated me to do the same in the unfinished area of my basement. I blogged about it and have yet to follow through because it is an overwhelming task. You have provided me with some great inspiration. Thanks so much! WOW! You have such a fantastic space to work with! I'm converting a tiny shed in to a craft room :L Nice ideas on storage as well. I am completely inspired. I have a spare bedroom (an utterly mess) that is zoned to be my craft room. Thanks for the inspiration!!! Just happened upon your post of your craft room....I love it...mostly because it reminds me of my own...in the basement....in a storage room...but I've made it my own...and someday, it will be really nice. maybe. You have just inspired me! We are moving into a house where I will have a craft room all my own. But, it's in the basement and we dont' have plans to "finish" the basement for a couple of years. I am totally stealing some of your ideas. Can't wait! Thanks! So jealous! Wish I had a space of my own! Loving everything you did. It was worth finding your blog just for the words, decrapification and crapifying!!! I actually laughed out loud and will be stealing your terminology at some point on my blog...yes, I will have to find an excuse to use those words even though I have enough junk for decrapifying, I shouldn't look long. Thanks for a fun post even though it is ancient. it's so fab! i knew it was going to be tough checking out this post (raging jealousy!, i'd take a garage or even a card board box to make "a craft area" anyways it turned out really great if you ever are in the mood you could just drylock/primer your corner and paint it a bright color so its even brighter and happier! :D then i think it just might be heaven. DECRAPIFICATION... i knew there had to be a name for it! After seeing your transformation I'm brimming with mo-t-vaaashun to tackle my workspace. BTW, I'd love to have a basement like yours. 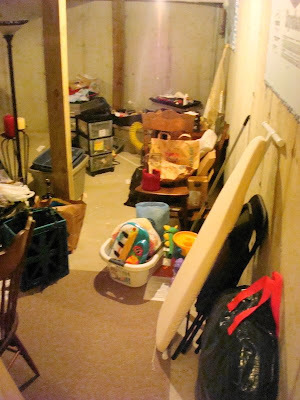 I am in the middle of (once again), decluttering my basement, unfinished (like yours). Your post has really inspired me, although I really HATE doing the work, there is a good thing at the end. (P.S.I also plan to eventually make a craft area, as I love to quilt and do papercrafts!) Thanks for the ideas. I googled "basement craft rooms" and found yours because of what you did. I, too, have my craft room in a basement. We bought a house 2 months ago and needed a scraproom. There was no place to go but in the basement. I used a folding table that was U.G.L.Y and created a skirt with leftover fabric that I had saved for 25 years!! I'm nearly down with the room and plan on doing a video of it to post on YT. I just wanted to share my excitement with you. i'm in the process of cleaning out my craft room...you have given me inspiration and hope...;0) it was overwhelming at first, but i have made some great progress...letting go of "what could be" has been the hardest part...if i haven't done anything with the item for a year or more, i'm trying to let it go...your room and new craft table (another post) are great! i'm sure you have a hard time leaving that little piece of heaven! God bless the work of your hands! More than the way the decor evolved, I liked the way you realized that you needed to have not just storage, but storage in the right places to prevent the dreaded dumping ground syndrome. I found your page on Pinterest and just love your creativeness!!! You made me want to go fix up my craft room!